Kendrick Scott. Photo by Jimmy Katz. Kendrick Scott’s Oracle were a hit before they even played a note on Wednesday night at Scullers. At least in terms of audience. It wasn’t just that they filled the club to near-capacity (165 seats). This was a crowd that crossed generations, gender, and ethnicities — yes, Asian-American guitar students (Oracle’s Mike Moreno was a draw), young African-American couples, Berklee kids of all stripes. The usual greybeard contingent was in attendance (including yours truly), but this was a crowd that skewed young. If anything else were necessary to deem this an “event,” Scott’s sometime boss Terence Blanchard was sitting down front, and Joe Lovano was at the bar. 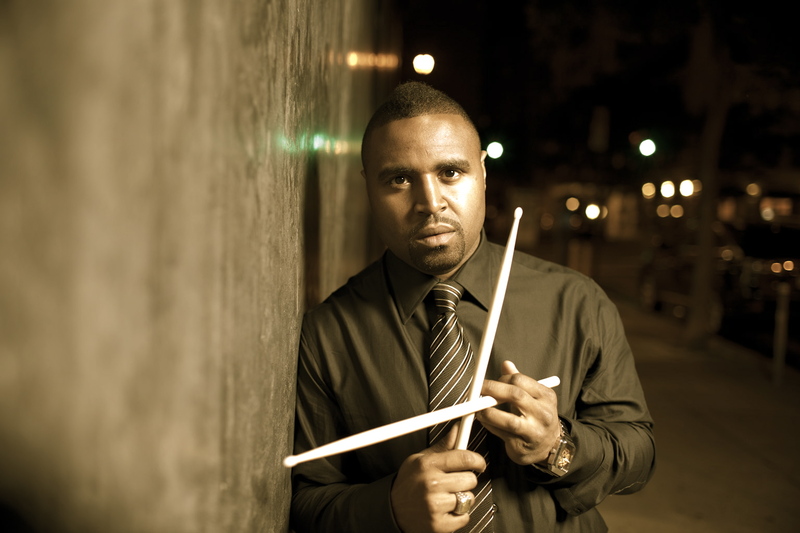 From the stage, Scott — 33, and a Berklee grad himself — said that the first time he played the club was when Roy Haynes was receiving an award (the first of the awards now named for Haynes, presented by JazzBoston in 2009). “Roy Haynes played my drums,” said Scott. “It freaked me out.” Scott looked sharp: red-and-blue check blazer, peaked white pocket handkerchief, white open-collar shirt. The music, too, was a mix of stylistic flash and poised, business-like concentration. Besides Moreno, Scott had John Ellis on tenor sax and bass clarinet, Taylor Eigsti on piano, and Matt Penman playing bass (in his first night with the band). The music often proceeded in the form of post-rock rave-ups. As in the first number of the night, “Pendulum” (from the band’s 2013 album Conviction, on Concord), Penman laid down a vamp, guitar and piano played a long-toned, repeating melody line, and then Ellis unfurled a secondary line on tenor. Those melodies repeated behind the soloists, building, with Eigsti pumping the chords in time with his left hand, Scott layering a ferocious mix of tight patterns that covered every corner of the beat. I’m still getting a fix on Scott’s astounding drumming. The best I can do is say he’s like a hip-hop Elvin Jones. Whereas Jones gathered his beats in long sweeping phrases, Scott builds his in tight club-inflected patterns that nonetheless pack the same kind of carrying-the-band horsepower. And his sense of measured detail is always on the money, whether echoing an end-of-phrase tenor flutter by Ellis with his own chiming cymbal pattern (sticks tapping the edges); playing his snare bare-handed, popping it with his right index finger and slapping it with his left palm; or accenting a solo with a little “zip!” he created by flipping his snare upside down and dragging his stick across it. The set ended with Conviction’s title track — a round robin of short solos from Eigsti, Moreno, and Ellis that ratcheted up the tension on every turn and had the audience screaming (especially for Eigsti’s impassioned extended lines). It closed the set perfectly — the big finish that not all jazz musicians have in their repertoire. Like “Pendulum,” “Too Much,” and Scott’s “Liberty or Death,” it also displayed another occasional quality of Scott’s music: a brooding intensity that can turn explosive, even ecstatic. An encore of the Duke Pearson ballad “You Know I Care” was lagniappe that provided another kind of closure — emotionally and historically. Still stylish, still serious, still taking care of business. This entry was posted in Live review and tagged Berklee, jazz, John Ellis, Kendrick Scott, Matt Penman, Mike Moreno, Roy Haynes, Scullers, Taylor Eigsti, Terence Blanchard on April 24, 2014 by jongarelick.